You may not see it right away but eventually, you notice a small puddle of oil under your car, possibly dripping from the engine area. There might also be a strange burning smell when you turn the car on and you see blue smoke coming from the tailpipe. All of the above signs point to a serious oil leak. To confirm your suspicions, you should check the oil dipstick. If the level drops far faster than usual, this accelerated pace indicates your car is leaking oil. Aside from this key factor, also pay attention to the following signs. This can be an equally surprising and concerning sight. Oil has crept into your car’s combustion chamber, but how did it get there? Your piston rings or valve seals may have cracked or worn away and now, the oil has started to drip into the chamber. Eventually, it ejects as a strange-smelling blue-gray smoke. Another common source is a cracked cylinder head or engine block. In these instances, you won’t see an oil puddle on the ground. Instead, your oil has started leaking into your coolant system. To check for this issue, look under your engine oil and coolant caps. The liquid will appear muddy, if not brownish-colored and will have a sweet, oily scent. 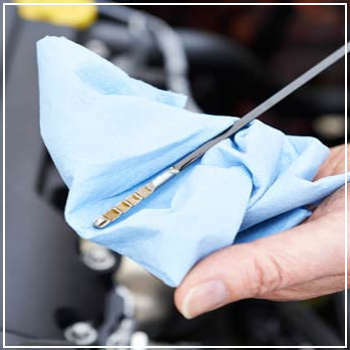 Leaks also indicate your car has a degraded engine gasket, oil seal, an oil pan leak or a bad connection. If you’ve got the skills, you can check these parts under the car, as well as the oil pan drain plug for any possible leaks. In an ideal situation, you or an experienced technician will find loose bolts that simply need to be tightened according to the manufacturer’s specifications. If you don’t look or choose to ignore the issue, the oil can spread throughout and degrade more components, including the rubber hoses, seals, the timing belt and engine drive belts. If it gets into your engine compartment, the risk of a vehicle fire increases and the engine could fail at any moment. If the oil gets into your exhaust manifold, you’ll spot smoke or see flames. How Serious Is The Leak? At least once a week, at a specific time and location. If your oil stays the same for four consecutive weeks, your car likely does not have a leak. If your car’s oil levels steadily drop over this timeframe or you notice stains after your car has been parked for more than an hour, oil is leaking from somewhere in your car. If you notice at least a quarter-drop on the dipstick, there’s a chance your car has another leak or related issue. Whether you need an oil change or a technician to examine your vehicle, bring your car to DaSilva’s if it is leaking oil. To make an appointment, give us a call today. Why Are My Headlights Not Working?